Everyone should have a grandma like my grandma. I have some of the best memories of her and just about every day that goes by, I think of her. Sometimes it’s some crazy thing she used to say. A lot of times I think of her when I crochet. As a kid, I anticipated visits to my grandparents like some people look forward to vacation. We’d arrive after a four hour drive and my parents would be exhausted. But grandma would open the door even before our car doors closed and…boom..4 kids running in at full steam and getting the biggest hugs and smoochiest kisses. Her thick accent would warm our hearts and she’d say love words and smile. And there would be more hugs. Delicious smells would drift in from the kitchen. And the whole house just smelled like grandma’s house–you know–a smell you can’t quite describe, but if you closed your eyes and smelled that smell you would be taken right back there. It was delicious and it was good. Not long after we arrived, grandma would slip to her bedroom and come out with a bag full of crochet wonderment that meant crochet gifts were coming! And if it was winter that usually meant slippers. Now grandma had a habit of finding a pattern she liked and then making a lot of them. Like really a lot. Hundreds even. She also had strong opinions on things that were hard to change. And so what that meant was that grandma found one pattern of slippers that she just loved and then she made them for EVERYONE every year for like a decade (or two). 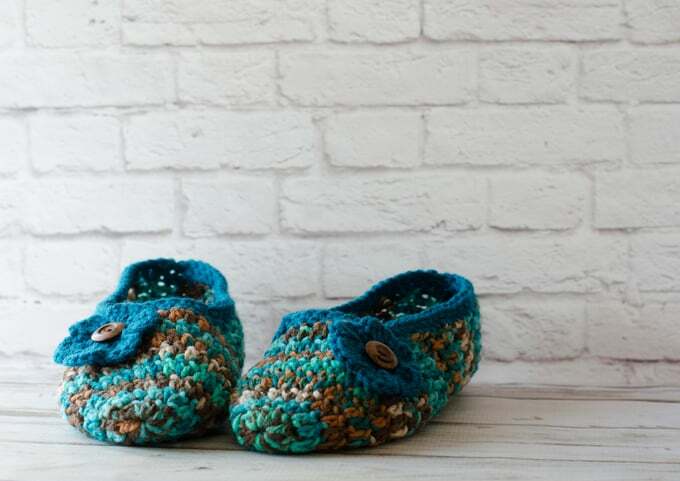 And that also meant that someone once tried on a slipper, found it a bit too short, and from then on, grandma crocheted everyone’s slipper to the new longer size. As a result, I always had slippers which were way too big for my feet and I had to be careful not to trip a little when I walked. But I never said a word because my grandma made them and I loved them just the same. 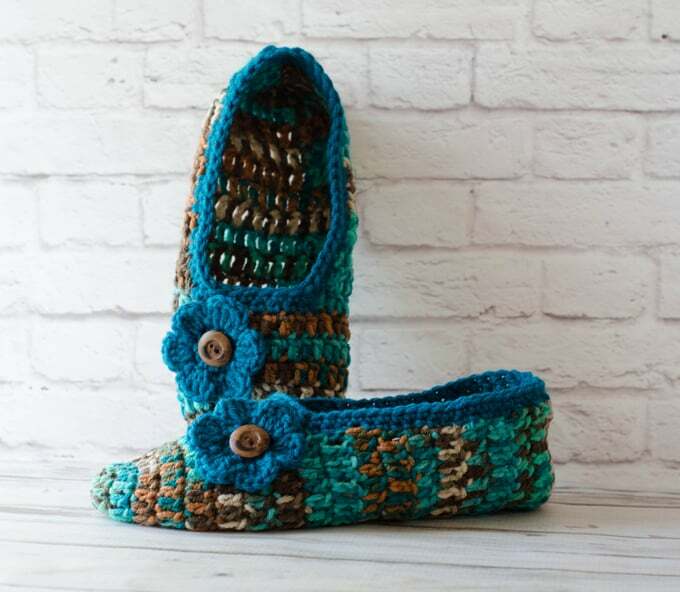 I thought I’d try my hand at designing crochet slippers that are a little more up to date. I picked up this variegated yarn forever ago. 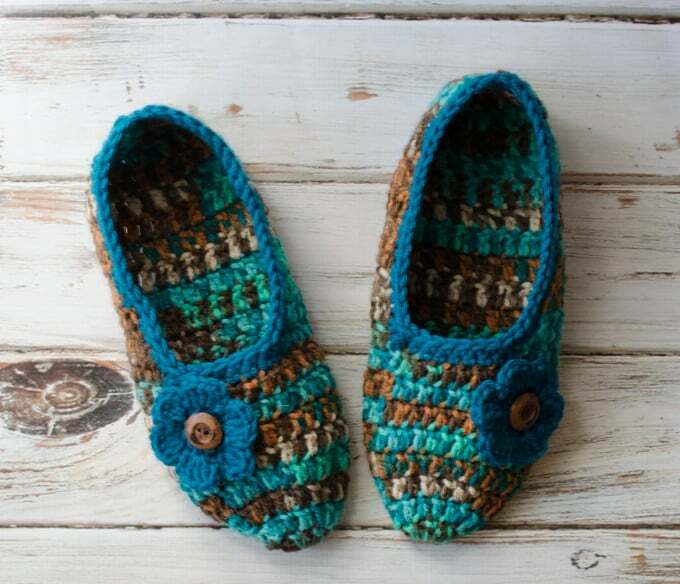 And when the leaves started to turn and the air got a bit chilly, I thought about that yummy yarn and these delicious crochet slippers were born. I love rich colors and the little wood bead in the center of the flower just makes me smile. They are also super quick to make. These slippers will fit a size 8-9 women’s size. If you need them smaller or larger, just adjust the number of rows or adjust your hook size up or down. Worsted weight yarn: I used 2.5 oz of Red Heart Super Saver, color: Reef. For contrast, I used a small amount of turquoise I had in my stash for the contrast. R1: Make a magic ring and dc 12 . Join with slip stitch to 1st st. (12 st). R5-8: Ch 3, dc in ea st (32) Join with sl st to first st after each round. R9: Ch 3, dc in next 23 st (leave 8 stitches free). Turn. Note: Try on the slipper and add or subtract rows here as needed for length. R19: Ch 3, dc in next 9 st, dc 2 tog, dc 2 tog, dc in last 10 (22 st). Fasten off yarn, leaving a strand for sewing. R1: With the right side of the heel facing you, join contrast yarn to the right of the center. Sc 2 tog, sc 2 tog (this cinches in the heel a bit). You are working in the sides of the double crochet used to make the slipper. Work 2 sc in each stitch around. At the inside corners (by the toes), sc 3 together. join with a slip st to the 1st st in the row. R2: Ch 1, sc around in ea stitch of the previous round. At the front corners, sc 2 together. Join with a slip stitch to the 1st stitch. Fasten off and weave in ends. The flower is made out of the same contrasting yarn, following the Easy Crochet Flower Pattern. Sew on flowers and weave in any ends. 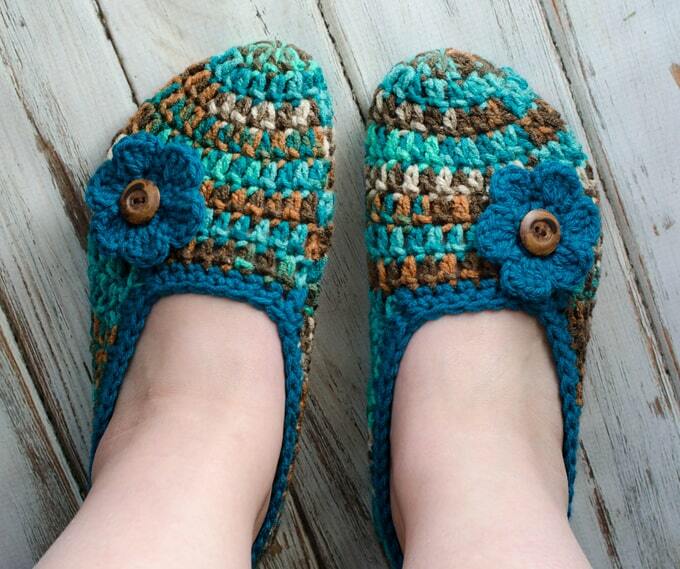 And your crochet slippers are done! I’ve been wanting to make a pair of slippers. Thank you for the pattern! The print friendly feature takes seven pages to print out. Perhaps getting the pattern into a plain pattern format would help shorten it up; lose the 1st, 2nd and/or 3rd wording…..smaller pictures….etc. Thank you, too for a great looking pattern! Thanks for your kind words about the pattern. It is one of my favorites. The patterns on the blog are formatted for online reading and accommodate laptops, tablets and phones. ‘Print Friendly’ is an app that reads the coding and “removes” the ads before printing. I am exploring some options for offering an ad-free PDF format of my patterns at a nominal cost in the future. Another option is to copy and paste the text you want to print into a word processing program and then print from there. Oh, yesh……..I’m a copy and paste freak; LOL!! Oh, : US I9/5.50 mm crochet hook…..for the flower…..I’d make it read: I/9….the I9 looks like a size 19. I started the pattern but have no idea what you mean by “sew the heel”. Help! Easy peasy. Just fold the work in half and use a yarn needle and the yarn end to sew the 2 edges together. That forms the heel. Love the Pattern. Going to start a pair. Thank you for this. My Grandmother used to make similiar slippers out of washcloths. She made several for everybody. Gave her something to do. Do you suggest putting anything on the bottom of the slippers for tread? The pattern did not mention anything.